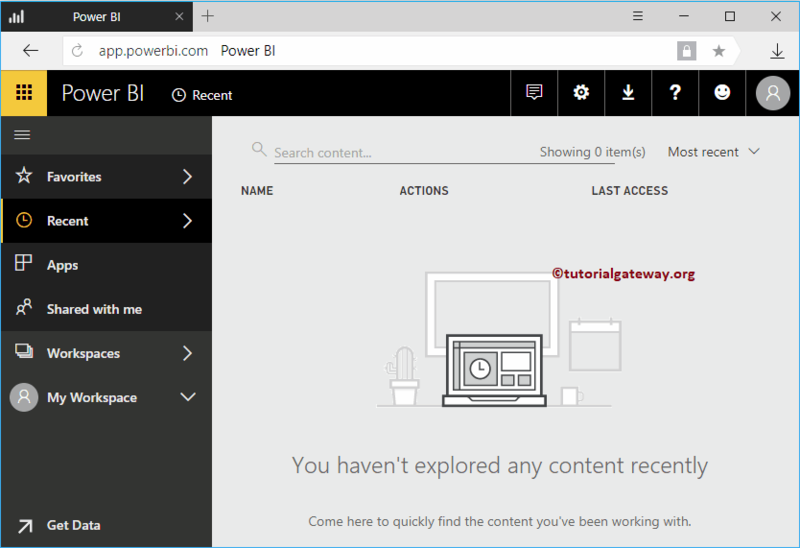 In this article is an introduction to Power BI Dashboard. 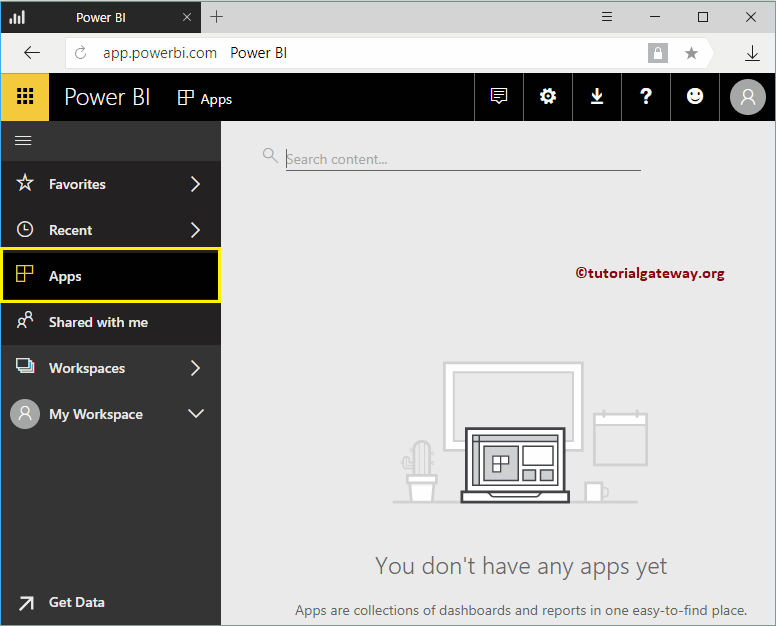 When you open or logged into a Power BI Service, you can see the Default Power BI dashboard. If you find something interesting, i mean a report or a dashboard then you can add them to favorites for quick access. Those item will be displayed in this section. 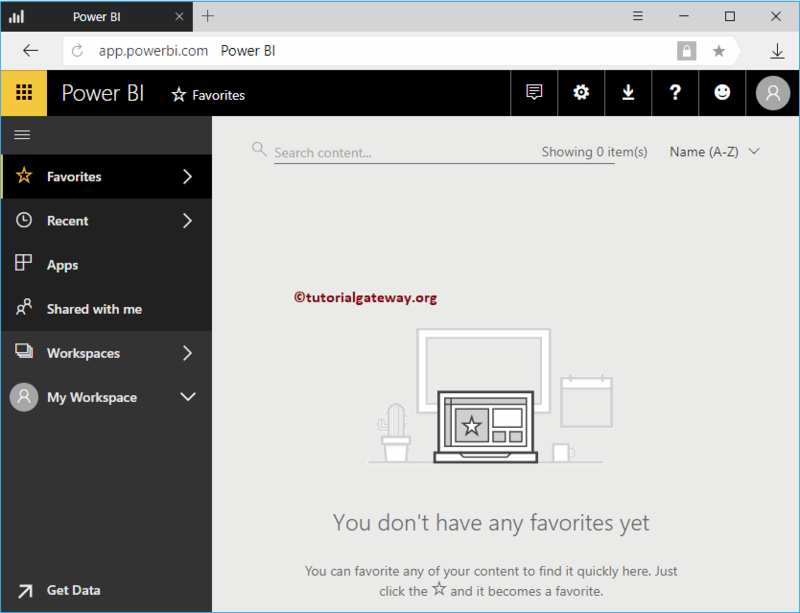 I suggest you to refer Power BI favorites article to understand the addition of dashboards, and reports to favorites. If someone in the organization shared a report, or dashboard with you then those shared items will be displayed in this section. Please refer Share a Dashboard, and Share a Report article to know about the sharing options. 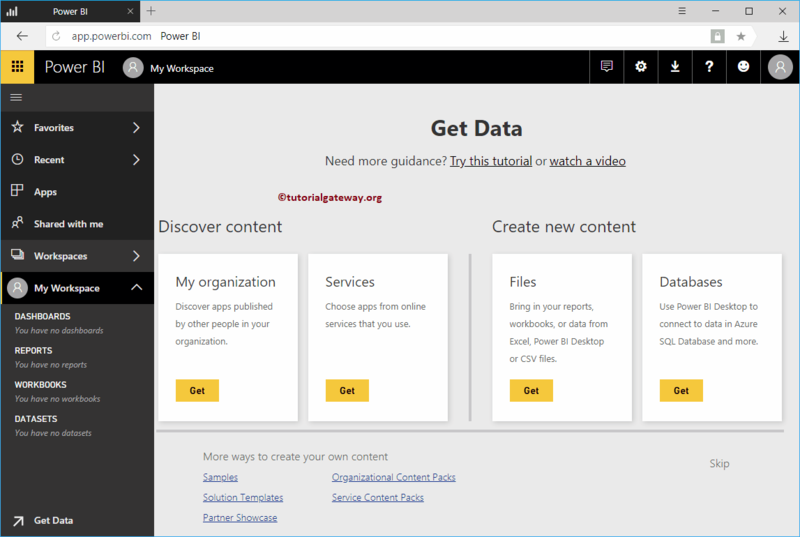 Power BI Workspace is a collection of Dashboards, reports, Workbooks, and Datasets. It will display the work spaces that are available for this account. 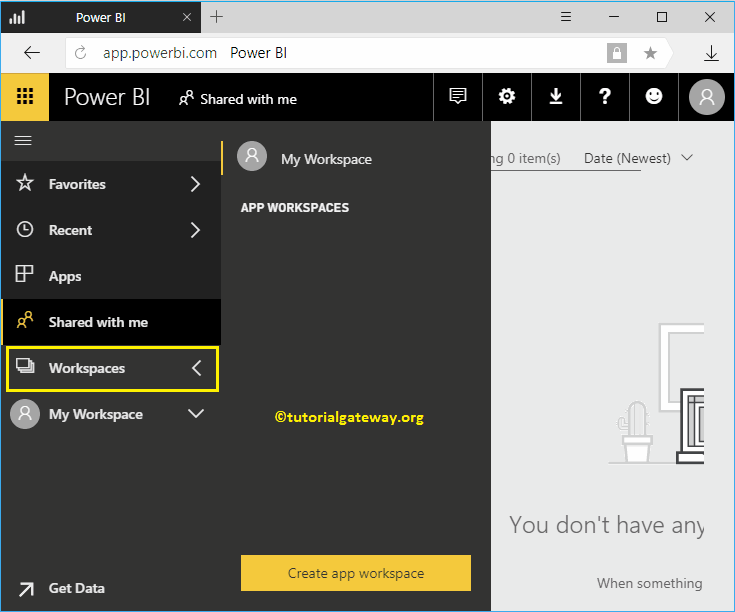 I suggest you to refer Create Power BI Workspace article to understand the creation of workspace. 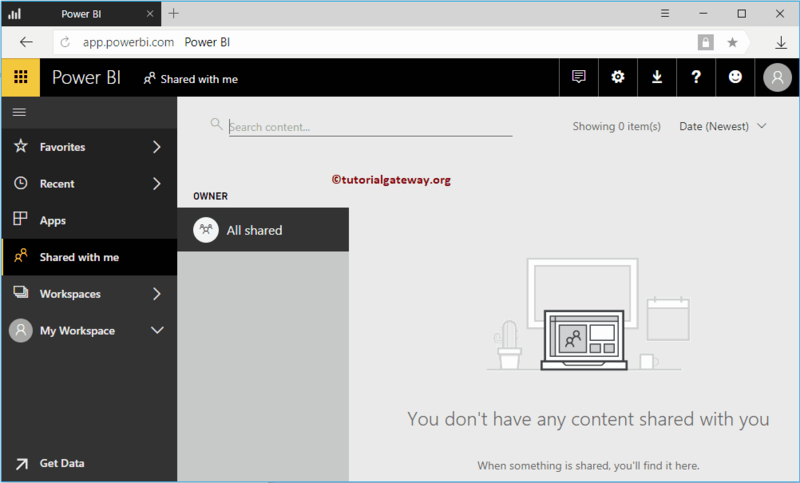 This is the default workplace created by the Power BI service, and this is the default one too. If you are opening this Service for the first time then, it may display the below shown page. You can use this page to import data for creating visualizations. By clicking the Skip button, or clicking the My Workspace tab will open the following window. 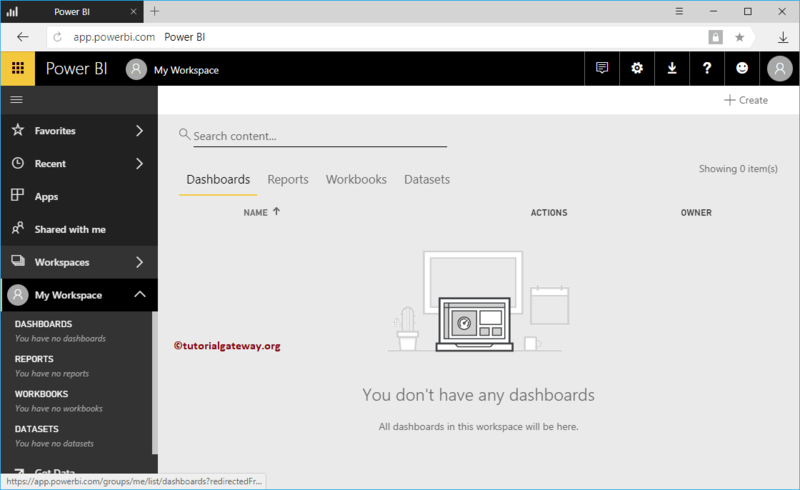 Dashboards: The Power BI dashboard section will display the Power BI dashboard (s) that are available in this workspace. Using the create button, you can create a Dashboard too. I suggest you to refer Create a Dashboard article. Reports: Reports tab will display the Reports that are available in this workspace. Using the create button, you can create a new report also. I suggest you to refer Create a Report article. Workbooks: This section will display the Workbooks available in this workspace. It means, Excel workbooks that you uploaded (not imported) into the workspace. I suggest you to refer Upload Excel Files article. Datasets: This section will display the list of available datasets. Using the create button, you can create a Dashboard too.